SparrowOS is always identity mapped so never has memory map penalties. Depending on the hardware the IO device may be able to notify the cache controller of the impending write operation. If this is not available the operating system can provide support which a device driver developer will be aware of. Sandy Bridge E class servers as discussed in the article introduce DDIO which allows direct transfer from a network card to the L3 cache for reduced latency. X86 processors only do a limited TLB flush, the pages marked as global are kept. Depending on your OS' use of this flag that could mean they're not flushed at all. As someone not particularly experienced at concurrent programming, it is still unclear to me what the fallacy is about. I never heard about "flushing the cache" - any examples of such incorrect reasoning? Finally, what are the implications of this fallacy being, well, a fallacy? I've been meaning to write a blog about x86 cache sub-systems for some time. Lately I've heard a few people say things that made me think caches are not that well understood. The fallacy is that many assume they know how the cache sub-system works. With a better understanding of how hardware works we can all write code that shows more sympathy and thus executes more efficiently. At the very least we can all gain an appreciation for the good work our hardware friends are putting in. I find my own knowledge is expanded by writing and the subsequent helpful feedback it brings. Understanding the memory hierarchy is key to getting the best out of tools like taskset and numactrl for an example of implications. "ARM does not use address space tags on TLB entries" -- are you sure that's correct? ARM supports ASIDs (address space IDs) on TLB and icache entries. I admit I haven't looked at the Linux kernel to see what operations it's actually doing on a context switch, though. Looks like you are right and ASIDs came in with ARMv6. I've obviously not kept up sufficiently with ARM. I have noticed that Samsung suggest Linux still flushes on a context switch but I've not been able to verify this. That pdf talks about running uClinux on an ARM9 (ie ARMv5) processor that indeed does not have a ASID-tagged TLB; requiring a full flush on context switch. Additionally, those processors did the cache lookup based on the virtual address (I presume so HW could avoid blocking on TLB-lookup or do it in parallel) so to avoid cross address space contamination you had to flush+invalidate on switch. Theses days on ARMv6, v7 and the upcoming v8 (ie ARM11, CortexA8/A9, etc) TLB entries are tagged by ASID and the caches are indexed by physical address so much of this becomes less relevant. If an OS could guarantee processes exist in non-overlapping virtual address spaces (as does uClinux), this could be relaxed., and there were HW tricks which could assist with this. Search for FASS (Fast Address Space Switching) by Wiggins, and the use of PID Relocation to generate globally unique Modified Virtual Addresses as an alternate technique to uClinux for achieving this. When changing rounding modes, as specified in IEEE-754, on x86 the FPU pipeline is unfortunately flushed. My understanding is that the L1 cache _is_ flushed on some context switches. As the L1 cache circuitry basically runs at main core speed, it is indexed not by logical address, but by physical address. To put it behind the TLB would be too slow. As such when the page table is modified the L1 cache needs to be (partially) flushed too. One other minor comment: you correctly state there are hundreds of physical registers on x86; however "Compilers will allocate our local variables and function arguments to these registers." is a little disingenuous to the on-chip scheduler/reservation station/flow analysis/renaming circuitry. The compiler allocates to the (considerably fewer) architectural registers, and then the on-chip wizardry allocates those to the available physical registers on demand. Coffee fuelling the technology industry. I love the stuff too! Thanks for the feedback. I agree the registers part could do with more description, in the reduction I may have over simplified this to the point of being misleading. On the L1D, are you sure about this? My understanding is that it is physically tagged and the TLB lookup happens in parallel on the set with at most one in the set chosen. I'm confirming this with my hardware friends. Check out this paper for an overview in section 1. So it took me a year to reply (sorry!) but I've been unable to find the reference I thought I had to the physical mapping of the L1 caches...apologies for tardiness of reply and for the confusing post! ..."they're are physically tagged and virtually indexed" ... "L1 is 32k, 8-way associative, it means that it uses 64 sets, so you need only addr bits 6 to 11 in order to find the correct set. As it happens to be, virtual and physical addresses are the same in these bits, so you can lookup the DTLB in parallel with reading a cache set"
So, there's definitely a logical address component, but it doesn't really amount to anything as the physical address is still used to check if an entry is for the right address. As such, there's clearly no need to flush the L1 on context switches after all. Short but very interesting post. I've seen confusion between this and a pipeline flush (due to atomic instructions/memory barriers or branch prediction misses) as well. Good overview and I agree that 40ns is a good number for the QPI latency. One thing that surprised me for randomly reading main memory how much it helps to have additional threads. Each of 8 memory channels on a dual socket can handle a cache miss in approximately 65ns (agreeing with the original post). memory this can be pretty helpful. So with 1 thread I see a random cache line per 59.53ns. 43.5ns. You get that on each of 8 channels so 43.5/8 = 5.43 ns. I think the additional gains are for some additional pipe-lining, or maybe having more dram pages open. Could you or the author explain how you got the timing delays for these operations? "This is more efficient than using volatile because a volatile field requires all accesses to be barriers and this effects some performance optimizations. " In the blog I reference C/C++ and not C# which has different behaviour. My understanding of C# is that all writes to fields follow StoreStore (i.e. stores are not reordered with other stores, aka TSO like x86) semantics as a software, and not hardware, memory barrier. To achieve a hardware memory barrier or full fence you would need to use Thread.MemoryBarrier(). Also the C# volatile access come with a full fence to ensure sequential consistency like in Java and C/C++ 11. I'm trying to reconcile this blog with other seemingly definitive articles (such as http://gee.cs.oswego.edu/dl/cpj/jmm.html and http://www.cs.umd.edu/~pugh/java/memoryModel/jsr-133-faq.html#synchronization) that explicitly talk about flushing the cache. As I mentioned even experts mistakenly discuss this subject :-) Maybe you should raise this subject on the concurrency interest list and see how people respond. The cookbook http://gee.cs.oswego.edu/dl/jmm/cookbook.html also mentioned: "holds stores waiting to be flushed to memory". "ensures that Store1's data are made visible to other processors (i.e., flushed to main memory) "
Interesting, i guess author sometimes might think this might be more easier to "understand" but it is really confusing sometimes also. I am reading a paper about Memory Barrier and CPU Coherence Protocol, write to memory happened when "Write Back', but so many blog/article talked about "Flush to main memory" when "Barrier", this really confused me. This blog is great, It made my day. "Back in the day" we assembler programmers had to be really concerned about flushing the cache. It was real, and for benchmark purposes had major impacts. Kids today ("programmers") don't realize the effort one had to go through to maintain excellent performance. It required a full understanding of chip design, architecture configuration, etc.
. Found... Carry on with speculation. Note that the data cache you refer to is not the same as the instruction pipeline speculation cache. We don't want to blow either, but while we have our quanta of time in control of the processor, we need to use it before the context switch. Furthermore, we tended to operate at higher priorities for our code that was written in assembler, which means a higher quanta of time once you get control. It was a waste to get the privilege, and not use it. There were other tricks we could do, such as an indexed remote execution of a block transfer (essentially two remote instructions), and they didn't know how to restore the P-state in that case, since the execute-remote was indexed post instruction, and the BT was indexed pre-instruction. We could then run a block transfer with a large counter in R1, and capture the fall thru when we got back control after being interrupted, and determine the average instruction count we received at that priority, on average, before being pre-empted. Think kids today have to worry about that? I find this information very interesting. Would you mind sharing your sources on the behaviour of the Intel Caches? Or maybe some good references? It might greatly help me on my Master Thesis. Thank you! The following make a good start. 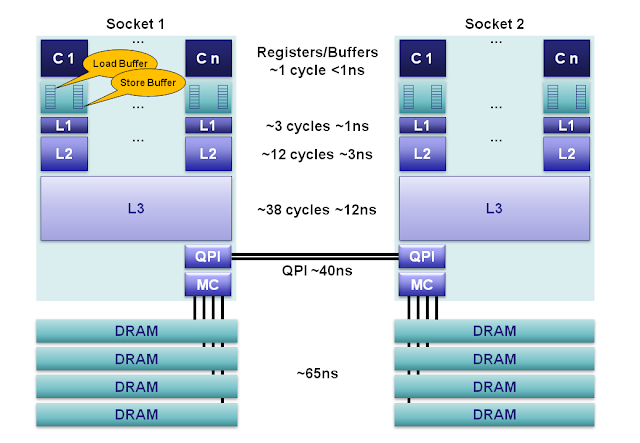 Does cache coherency includes what is stored in write and read buffers? So if some write of value v1 to address a1 is stored in buffer for core 1 than if core 2 reads a1 will it read a1 or some stale value?